I love me some good antiques and vintage items. You can buy most everything in your house from IKEA but if you judiciously add in some antique or vintage items, you can still end up with a winning room. Why? Unique-ness! Often, antiques and vintage items are either one-of-a-kind, or close to it. And the only thing that can make an antique or vintage item better, is if it’s from within your family. I am a bit of a sentimentalist about history. Knowing the history of an item makes it infinitely more interesting and meaningful to have in your home. We own a few antiques and vintage items that have been handed down from both sides of the family. 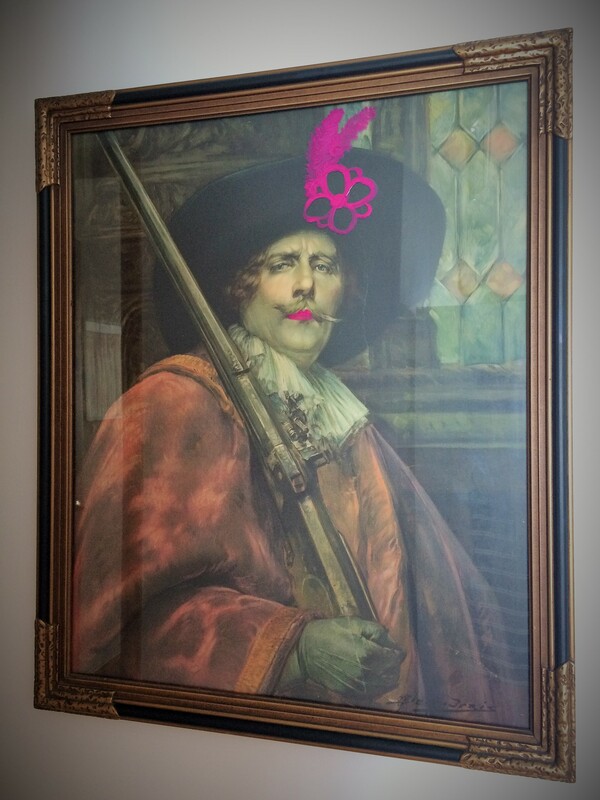 But literally, only a few: a bronze Buddha statue, an art deco lamp (which sadly is waiting for me in Australia as I didn’t trust the removalists not to break it) and a painting of a cavalier. The last one isn’t something I would have chosen for our current home. It really needs an old house to go in, preferably in an office or a library. Wood panelling in that room would be even better! Or an old Spanish castle maybe. A bright flat in HK isn’t quite right for it, but it has to be hung up somewhere in this apartment as we have nowhere to store large paintings! 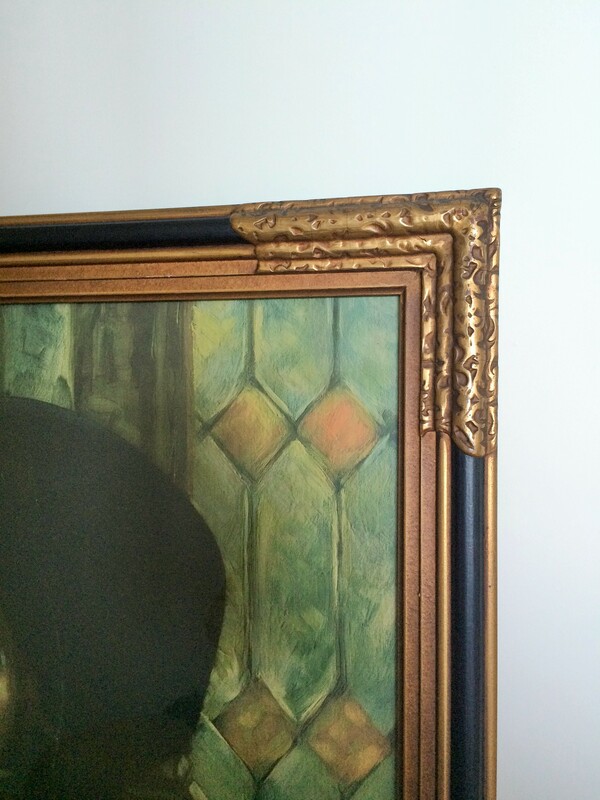 I have three main problems with the painting: firstly, the frame was in bad condition on the painted sections, with large chips and quite a few dents. I am no stranger to “patina” and actually love it, but sometimes the damage to an item is distracting rather than enhancing, as it was in this chap’s case. Secondly, the maroon was a very dated colour and stuck this poor guy firmly in the early 80’s. Considering I was around in the 1980’s, I don’t like to think of that era as vintage. Or antique. My final issue is the look on his face. It’s a strange mixture of pomposity and confusion. And entirely too serious for our house! 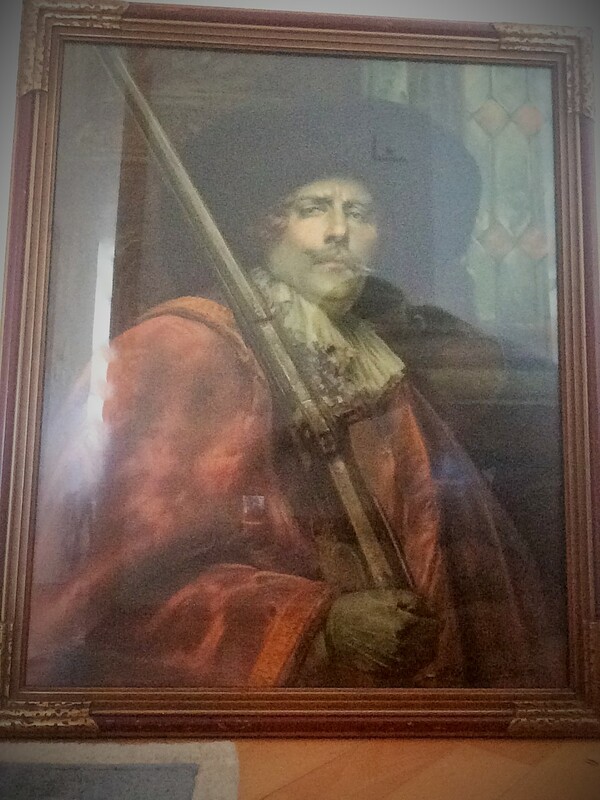 Paint that smirk off the old guy’s face, but temporarily. The final step was much quicker (taking all of 5 minutes) but a bit more risky, as I wasn’t sure if my husband would be ok with it. But since it was a temporary measure that is easily reversible, I went with the “it’s easier to ask for forgiveness than approval” approach. If he really didn’t like it, I used a water based paint that can be wiped off at any time. I used it only on the outside glass of the picture. I may remove the flower/feather combo (yes, that is what that’s supposed to be!) and just keep the lipstick. We will see how I like it in a week! Perhaps you too, have an old family heirloom that could use a new lease on life?! If it has glass on the front, have a crack at adding something new! 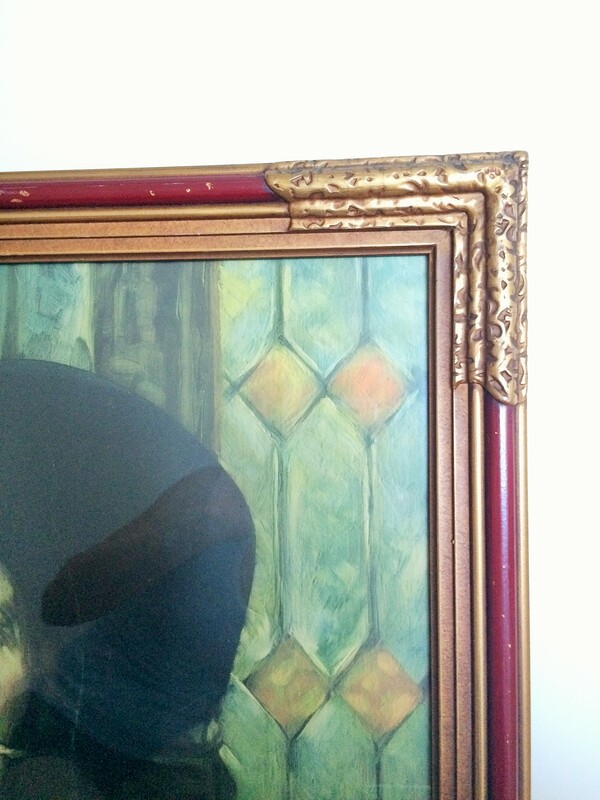 Or, if you have proper artistic talent, you can always buy some old paintings at a thrift store and get to work on adding in some fun touches.